Fiction – paperback; Harvill Secker; 312 pages; 2007. Translated from the Icelandic by Bernard Scudder. Icelandic journalist turned crime writer Arnaldur Indriðason became a firm favourite of mine when I read his brilliant novel Tainted Blood (also known as Jar City) back in 2006. The book was a refreshing change to the normal formulaic crime books I’d read in the past, and the setting — the Icelandic capital Reykjavik — added an “exotic” touch. Of course there has been somewhat of an explosion in Scandinavian crime fiction since then, but it is Indriðason to whom I feel most loyal. Indeed, I have made a point of buying each new novel as it has been released, and The Draining Lake was no exception, although it did languish in my reading queue for about six months. This is the fourth Reykjavik murder mystery — starring the grumpy but troubled detective Erlunder — to be translated into English. It is typical Indriðason fare but for some reason I didn’t find the story as gripping as the others that preceded it. As usual, the crime being investigated is an old one — in this case a half-buried skeleton found in a lake after it drained as the result of an earthquake. The skull has been caved in and the bones weighted down by a Russian radio device. Forensics believe the skeleton to have lain in its position for 40 or 50 years. The police, under the direction of Erlunder, begin their investigation by looking at missing person files. Intertwined with this relatively straightforward police procedural narrative is a second storyline involving a group of Icelandic students studying at a German university during the Cold War. It is clear that one of these students is the skeleton that turns up Lake Kleifarvatn, so half the fun for the reader is trying to guess which one. But Indriðason plays his cards close to his chest and clues are few and far between. While I found large parts of The Draining Lake rather dull — perhaps a product of my circumstances, rather than of the author’s work (I’m living out of a suitcase while my flat is being renovated) or the fact that anything to do with the Cold War usually leaves me, well, cold — I did very much enjoy how Indriðason had moved the characters on from the last book. Erlunder is still struggling to maintain a steady relationship with his drug-addicted daughter while his long lost son returns to the fold. And the budding romance that began with a female biotechnician in Voices also takes a new turn. Other familiar characters have also been nicely developed — Elinborg is promoting a cook book, while Sigurdur Oli is dealing with a bereaved husband whose wife and child were killed in a traffic accident. It’s also refreshing to have the story set in an Icelandic summer, when the sun never sets, instead of the cold, dark, snowy Reykjavik that has appeared in previous books in this series. But on the whole I did not feel The Draining Lake was up to Indriðason’s usual high standards — although I’ll still be the first in the queue to buy the next one! Count me in the Indriðason fanbase. I’ve been preordering his titles ever since the enigmatic “Jar City” reeled me in. 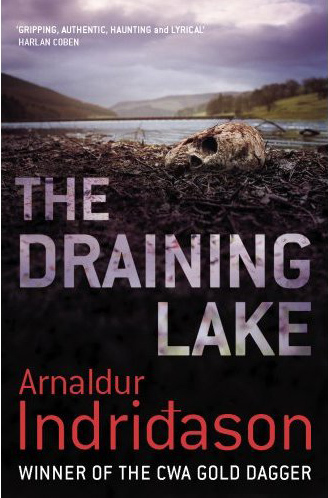 I haven’t read “The Draining Lake” – I’m saving it for a rainy day. Bernard Scudder died earlier this year. Do you know if a new translator has been found? It may be a long time before Indriðason hits the shelves again. Now this sounds interesting. As you’ve described in your review, it is the sub-plots, and lives described in the story that kept me a Wallander fan. Less action and more story. I smile each time you mention your book queue, Kim, as I have one of those too. Though lately have begun to make a list and then buy the book when I finish my last one. ainelivia, my book queue now stands at 150+ books!! It’s like my own personal bookshop/library — and still there are times when I can’t find anything in that pile that suits my mood! Oh, I think you’ve exceeded my best ever which was about 35. 150! where’d you find the space kim..